3 Gears Glass and Gifts – Featured Shop! The holiday shopping season is here, and this week’s featured shop is 3GearsGlassAndGifts! 3GearsGlassAndGifts is filled with functional art glass for everyday life. 3GearsGlassAndGifts is owned and operated in Colorado by Reba. She has been a glass artist for over 20 years. She loves to teach and create. Her home based studio specializes in ready made glass art for every day use and enjoyment. Having a background that started with stained glass, Reba likes to incorporate many different types of techniques into her creations. 3GearsGlassAndGifts has a wide variety of useful housewares, along with one of a kind pieces. A lot of Reba’s ideas come from nature, and stunning sunsets and sunrises that she sees. Her best sellers are her mosaic soap dispensers. Her shop also offers lotion dispensers, stained glass, jewelry, fused glass soap dishes, fused glass bowls, fused spoon rests, fused glass art, mosaic wall art, mosaic tissue box covers, and fused candle screens. Reba adds new pieces all the time and welcomes custom orders! This week’s featured shop is Legends of Darkness! Legends of Darkness specializes in breathtaking photography. Every image is thoughtful and stunning. Photographer Megan Campbell is the owner of Legends of Darkness. She lives and works in Easthampton, Massachusetts. She has been fascinated with photography since childhood. She considers herself an opportunistic photographer, because she rarely works in the controlled environment of a studio setting. She has a knack for seeing things that other people miss. She spends her days searching out objects that call to her, so she can share her unique vision with the world. She can turn any of her photographs into a gallery wrapped canvas or photo standout. 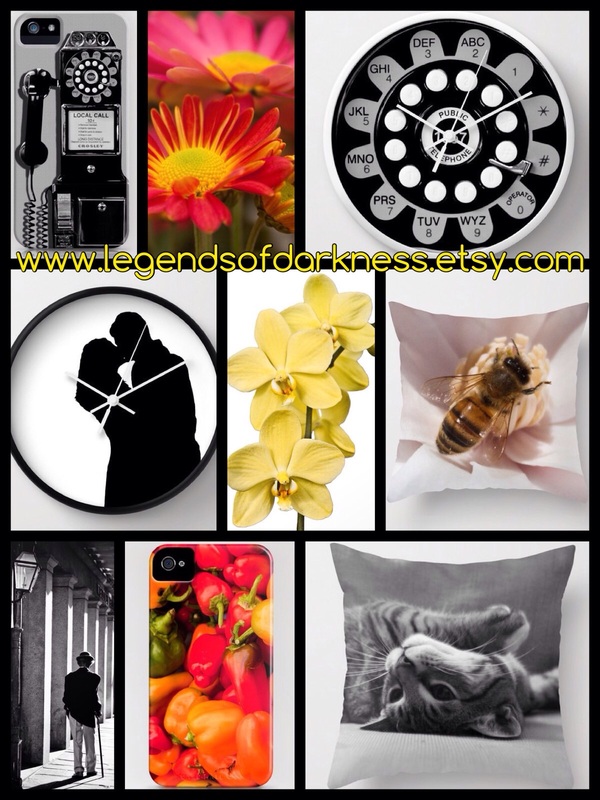 Most of her photographs can be made into beautiful greeting cards, cell phone cases, pillows, or wall clocks. She is happy to discuss customizations as well; including sizing, finishing, matting, and framing options.